The only good memories I have of school are from the very early years. Once I reached middle school, everything changed. I remember feeling so confused because I was intelligent and very outgoing. I quickly discovered that in middle school, it wasn’t cool to be smart, unless we were doing a spelling bee. I was always the first one chosen for those. In gym class, however, my mastery of spelling didn’t help me. Whenever they would pick teams, I was always one of the last three chosen. It was humiliating. I remember the jeers and taunting I would face every time I had to go to bat. I would purposely strike out just so I would be off home plate quickly, allowing my classmates to pick on their next victim. It was a very difficult time for me. I wasn’t chosen unless my peers could somehow benefit from my presence. I was never chosen to be friends with the popular crowd. I remember how I would wait for the bus in the mornings, fearing that I was going to have diarrhea, all because of the fear of the awaiting torture by my peers. Aren’t you glad that you are one of the chosen? CEV: With her own hands she gladly makes clothes. AMP: She seeks out wool and flax and works with willing hands to develop it. MSG: She shops around for the best yarns and cottons and enjoys knitting and sewing. I do NOT like to sew. Besides, I have heard that sewing can be quite an expensive hobby. The ladies who lived in the time when Proverbs 31 was written didn’t have Walmart, JC Penney, Sears, or even garage sales and thrift shops where they could shop. They did almost everything themselves. The closest I can come to living out the above verse is by doing my best to use my hands, gladly checking garage sales for clothing for our family. I also check the clearance racks and thrift shops. It can be time-consuming, and there are days when I come home with nothing except exhaustion. Rather than focusing on that, I must train myself to focus on the times when I have been so blessed for the effort which I put forth. Many times, I will pray before I go shopping or to garage sales. Then, if I don’t find anything, I knew that it wasn’t God’s timing for me to have the items for that day. I must remember that my life is in His hands, and He is not going to let us go without clothing. I would say that at least 75% of my daughter’s clothing comes from garage sales. A few years back when I lost a significant amount of weight in less than 30 days, I found that it was necessary to buy new clothing because I had nothing that fit me anymore. I still invested in the effort to check the clearance and sale racks, and did very well with my purchases. I also visited the Goodwill store a lot. I don’t remember the last time that I bought a new outfit because I have done so well at garage sales over the last two years. The items which I have found have been like new, and every time I wear them, I get many compliments. Bless the Lord for His provision! With as bad as the clothing styles are right now, we may all be forced to revert back to making our own clothing. Before I do that though, I am going to pray for God to raise up some clothing designers who see it as their mission to offer modest clothing for a modest price! Matthew 18:1, Jesus was asked who is the greatest in the kingdom of heaven. His answer was surprising. He said that whoever humbles himself like a child is the greatest in the kingdom of heaven. What does that mean? Have you ever watched a child playing with his daddy? He says, “Catch me, Daddy!” Excitedly, he jumps into Daddy’s waiting arms, never thinking that Daddy might not catch him. There is absolute trust and confidence. Have you ever observed a little girl running to Daddy, totally distraught over a broken toy? Daddy gently tells her, “Honey, don’t cry. I can fix this.” Her countenance changes to a smile, and she happily runs along. She is no longer worried about the toy, which moments ago had her in tears. Why? She fully trusts that Daddy will fix it. This daughter humbled herself and went to her father because she didn’t know how to fix the toy. Too many times, we are afraid to humble ourselves with our “broken things.” I am referring to things such as broken relationships, broken hearts, broken finances, broken children, and the list could go on and on. Childlike faith: Don’t leave home without it. CEV: She is good to him every day of her life. AMP: She comforts, encourages, and does him only good as long as there is life in her. MSG: Never spiteful, she treats him generously all her life long. One time I noticed that the dryer was needing to be pulled out from the wall and cleaned really well. Since Dean was working fifteen hour days, I didn’t feel right about mentioning it to him. One day, I got brave and decided to try and tackle this unpleasant job myself. I was so pleased when I was finished! I took great pleasure that evening in telling him what I had managed to accomplish that day, and I could tell he was pleased, as well. Often, when I ask how I can help, he will ask me to pray for him. He is depending on ME to pray for him. He’s not asking the church, he’s not asking his mother, but he is asking ME to pray for him. I can’t stress enough how important this is. The time that really sticks out in my mind is when I was pregnant. I felt an intense need to pray for his safety. The next day, he fell twelve feet off of a ladder, landing on his back. Other than being very sore for many weeks, he had no serious injuries. A dear sister told me one time that she has no doubt that my prayers spared his life. Had I not prayed, I believe that I would have delivered my daughter, only two weeks later, as a widow. One of the best ways I think we can help our husbands is by getting the book The Power of a Praying Wife. I often use that book during my devotional time. It is loaded with scripturally-based prayers, and praying God’s Word is very powerful. Our husbands are to be #1 on our priority list (after God, of course), so shouldn’t we make him #1 on our prayer list? The verse in the Amplified Bible mentions comforting and encouraging him. A lady I know sends her husband off to work with a kiss, and these words: “God’s favor and success go with you.” Find ways to bless and encourage him. Call his office before he even arrives, and leave messages for him. Put a love note in his car, where he will see it as he leaves in the morning. When my husband had a beeper, we had a code that I would use. If he saw a ‘3’ pop up, he knew that it meant, ‘I love you.’ If he got a message that said, ‘545’ or ‘615,’ he knew that I was telling him that supper would be ready at either 5:45 or 6:15. Giving him some advance notice would help him to know when to wrap things up for the day so that he could join us at the dinner table. Many times in the evening, we are tired, but it’s important to be there for our husband. If he needs comforting because of how hard things were at work, we need to work hard to affirm him. Men tend to see their worth as having to do with their occupation. We can affirm them apart from their job. One mistake we often make in affirming our husband is by focusing on his tender qualities. While it’s wonderful for our husband to be tender and sensitive, he needs to know that we appreciate his masculinity. Try complimenting something about his body, and watch him puff up like a proud peacock does when his feathers are displayed! As a virtuous woman, we should seek opportunities to do him good, living our lives to love him, not in word only, but in deed. This is our God-given task, and we should delight in doing it. No one else is called to do him good. God has given that assignment to US! What a ministry! I remember watching the news when it became public knowledge that John Kennedy Junior’s plane never arrived at the expected destination. There were several people speculating on what may have happened. One explanation was that John Jr. may have been flying by his feelings, rather than checking his instruments to see what they were saying. The expert went on to explain that when flying, your equilibrium can easily get off balance. It leaves you with the feeling that you are flying horizontally, when in reality, you can be nose diving straight for a crash. You have to follow the instruments, not your feelings. In a spiritual sense, we often do the same thing. Our feelings are so real to us that it is easier to follow them instead of following the Lord, who we cannot see. It is imperative that we learn to check our instrument – the Bible. We have probably all fallen pretty to this mentality. We may go shopping one day when our mental outlook may be obscured. By refusing to check our instrument, our depressed frame of mind may lead us to think that we will feel better if we treat our self to something that is not in our budget. We are trying to find satisfaction in things, rather than our Lord. CEV: Her husband depends on her and she never lets him down. AMP: The heart of her husband trusts in her confidently and relies on and believes in her securely so that he has no lack of honest gain or need of dishonest spoil. MSG: Her husband trusts her without reserve and never has reason to regret it. This lady’s husband is able to go off to work each day knowing that she is carefully managing things at home. He doesn’t have to fear that while he is gone, she will spend everything he makes. She values what he is doing, and while he is busy at making money to pay the bills, she is busy seeing that he has what he needs. She will run errands for him, see that his laundry is done, and have a hot meal ready for him when he gets home. There are a whole host of other not-so-glorious tasks that she will tend to while he is gone, and she chooses to do this joyfully. This lady realizes that she is the only one called to serve her husband in this manner. She sees it as part of her ministry, and that is partly why she chooses to do her tasks joyfully. She knows that by serving her husband with a joyful heart, she is ultimately serving her Lord. Her husband depends on her, and she doesn’t let him down because she knows that a virtuous woman is to be faithful in the most mundane tasks. She knows that she will receive a reward for this. She may not know when the reward will come, or what the reward will be, but she is faithful, choosing to walk by faith and not by sight. The fact that her husband trusts in her and has confidence in her gives her a joyful heart. Next to serving Jesus, serving her husband is her highest honor of the day. One thing I do to serve my husband is by helping him pack when he is getting ready to go out of town. I do this often while he is still working on other things, so that when he comes home, he sees that one item on his list is at least partially done. Sometimes I will even bake his favorite cookies to send with him. Other times, I will wait and bake them on the day he is coming home. Funny thing: As I sat writing this devotion, my hubby called me ‘Proverbs Mama!’ What a compliment! OK, ladies, what ministry are you going to do today for your hubby? Get to it, and do it JOYFULLY! 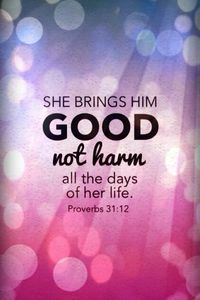 Many women are intimidated by the Proverbs 31 lady. As we start this study, I want to share something that I heard a long time ago that may encourage you. Some scholars believe that Lemuel (the writer of Proverbs 31), is none other than Solomon, son of David and Bathsheba. They believe that ‘Lemuel’ was similar to what we’d call a nickname. If that is true, then Solomon was taught these words by his mother — the very mother whom we all remember for her act of adultery. Yet, this same woman is describing some incredible qualities with her son! If what these scholars believe is true, then God brought about a big change in Bathsheba, and she became a very godly, noble, virtuous wife. If God can do that in Bathsheba, dear one, He can also do it in YOU! NIV: A wife of noble character who can find? She is worth far more than rubies. CEV: A truly good wife is the most precious treasure a man can find. AMP: A capable, intelligent, and virtuous woman-who is he who can find her? She is far more precious than jewels and her value is far above rubies or pearls. Virtuous = decent or modest, which I would translate to mean that she doesn’t follow after the latest fads if they are immodest, nor would she let her children dress in immodest ways. She has moral virtue and it shows in her words and actions. One of the many things we are engaged in as Christians is spiritual warfare. A dear sister in Christ shared with me that in the original Hebrew, the word ‘virtuous’ refers to a soldier, which goes right along with warfare. I picture this dear lady as one who would daily fight spiritual battles on her knees on behalf of her family. In the physical sense, we may see this lady dressed in nice, modest clothing. We may also see her as one who has a tender heart and a gentle and sweet spirit. Yet, in the spiritual sense, this woman was dressed in armor and ready to fight! I picture this lady getting up every morning, consciously putting on the armor of God. She reminds herself that she is really fighting against spiritual forces. Too many times, I think we allow our emotions to rule us, and when we do that, we forget that we are fighting a spiritual battle. We begin to look at it as having a fight with our husband, or a battle with the children. In reality, Satan has schemed to bring this fight into our home, and we get sucked right into his wicked ploy. This lady has learned how to fight against that tactic. She’s learned that while God has given her emotions as a gift so that she can feel a myriad of emotions, she must constantly be on guard to make sure that she is ruler of her emotions, rather than letting her emotions be the ruler over her. Stately = ‘slow, dignified’ (Webster’s) Could ‘slow’ refer to her ability to be slow to anger and slow to speak? Dignified could refer to a high position, high repute, or self-respect. I would imagine that because of this woman’s moral virtue, she brings a sense of high position to her husband, having a healthy self-respect for herself as well. She isn’t overly concerned about her outward, physical appearance like Hollywood wants us to focus upon, but she is intelligent enough to know that what counts is what is on the inside. If she didn’t believe that, then why would she be seen as a woman of noble, virtuous character? Pr. 12:4 A Virtuous and worthy wife (earnest and strong in character) is a crowning joy to her husband, but she who makes him ashamed is as a rottenness in his bones. (AMP) The latter part of this verse would be the opposite of a virtuous woman. The word ‘earnest’ here would refer to working with determination. Notice the word ‘crowning’ in this verse. In Webster’s, one of the definitions for crown was to put the finishing touch on. If we are virtuous women, we put the ‘finishing touch’ on our husbands. I Cor. 11:7 A woman is the expression of man’s glory, majesty, preeminence. (AMP) The CEV says that women were created to bring honor to men. Are we bringing honor to our husband in our words and actions? As others view our habits, actions, and attitudes, do they perceive that our husband is blessed to have us for a wife?